When it comes to men’s watches, most brands expanded their lineup during the 2019 edition of Baselworld with some solid additions. Some of them favoured evolution over revolution, further perfecting what are already great watches, while others developed breathtaking technical novelties. One of the great difficulties of any fair, and especially Baselworld, is to pick from this wide array of often very different watches the favorites that truly stand out. The partnership between Ferrari and Hublot is stronger than ever! Next to the stunning Classic Fusion Ferrari GT, did the brand also launch three Big Bang Ferrari’s marking the 90th anniversary of the brand with the prancing horse! All three are powered by caliber HUB1241, Hublot’s manufacture chronograph movement and all also feature a bezel made from carbon ceramic, resembling the brake disc of a racing car. The three models are fitted with a case made respectively of platinum, 3D carbon or sapphire, given them all a distinctly different look. Each of the watches also has a different strap, to set its character slightly apart from the rest. What a difference can a dial make? The answer to this is given by the new Patek Philippe Nautilus Annual Calendar which now features one in the hue of the first Nautilus from 1976. It provides the watch with a completely different character then the other dial colors did before to this model. The blue has a jeans color in the middle but changes to almost black on the edges. Combine this with the stainless steel case, as well as the annual calendar complication, and you know that we have a watch here that will create without a doubt a substantial waiting list. There seems to be no end to Bulgari’s expansion of the Octo Finissimo collection. With the new chronograph GMT, they have added yet another world record to their stable as there is no other automatic chronograph as thin as this one. They even combine it with a GMT-function, increasing the practical use of this watch to an even higher level. Fitted with a titanium case and bracelet does the watch weigh nearly nothing, while its design is unlike anything else out there. The strength of Rolex has always been that they are a brand of evolution rather than revolution. With subtle changes, they perfect their watches throughout the years, and this has resulted that they are in a league of their own. Part of this strategy is that they release varieties of their existing models that give a new interpretation to these classic designs. With the Daytona ‘Leopard’ does the brand show once more that they are a master in diamond settings as well. The dial resemblance the fur of this powerful animal, while the bezel is set with trapeze cut diamonds. The black Oysterflex bracelet gives it a sportive finishing touch! With a 1/100th of a second chronograph fitted with two tourbillons, did Zenith create a stunning watch. Even more so, because one of these tourbillons is dedicated to the timekeeping of the watch, running at 5Hz or 36.000 VpH. 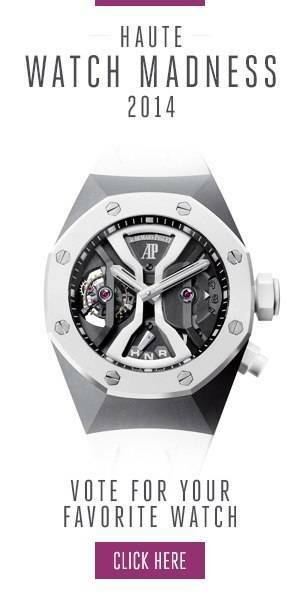 The other one stands idle until you engage the tourbillon, then it starts running at 360.000 VpH or 50Hz, a incredible speed, supporting the 1/100th of a second chronograph function. Because both tourbillons are positioned on the dial side, they serve as a constant reminder of how technologically advanced this Zenith is.